Low Flow and Efficient Shower Heads To Help You Save Water Energy! 1.75 gpm, 1.5 gpm and 1.25 gpm shower heads are an easy and quick way to save water in the shower! The difference between the shower heads at the bottom of this page and the one(s) you have in your home is the FLOW RATE. The best way to compare shower heads is by reading the flow rate, in gallons per minute (gpm), which is usually stamped on the showerhead. Most new showerheads flow at 2.5 gpm. Pre-1994 shower heads could range from 3-7 gpm. When you switch out your old shower head, your savings is simply the difference in the flow rates. 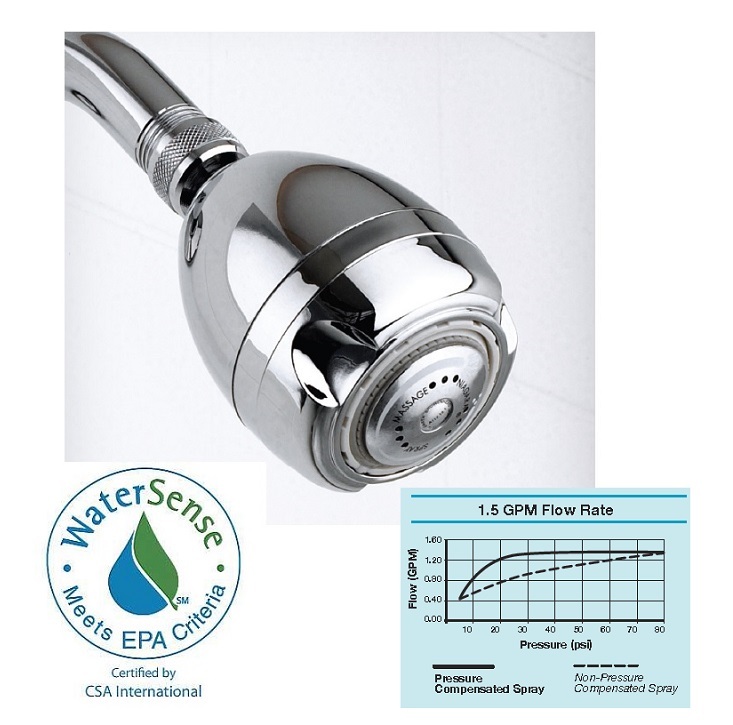 Compared to 2.5 gpm, by selecting a new low-flow 1.75 gpm shower head you will save 30%. Choose 1.5 gpm to save 40%, and 1.25 gpm to save 50%. Low Flow Earth Massage Shower Head - Our best selling shower head! Fully adjustable - a strong steady stream of water or a pulsating massage. Will not mist or sputter. Pays for itself in just weeks.